Today, I wanted to discuss yellow diamond engagement rings emerging trends of 2016. All of our yellow diamond rings are designed to feature an 18 karat yellow gold cup, which brings out the color of the center yellow diamond. If you would like to learn more about any of these settings, please click on their image below to be taken to the product page. Both of these rings feature a row of fancy yellow diamonds around the center stone. Style number HE144-YD has a double halo, with the outer halo being set with the fancy yellow diamonds. This gives the ring a distinctive flair. 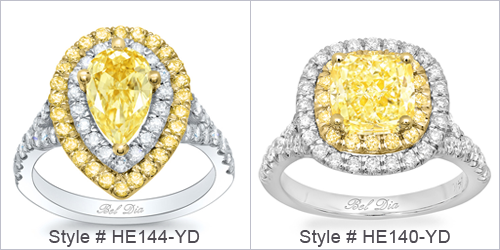 In contrast, I included style number HE140-YD, which features a fancy yellow diamond inner halo. This halo further enhances the color of the center diamond and makes it appear larger. Diamond accented engagement rings are incredibly popular, so why not use fancy yellow diamonds on the band? Both of these settings are shown here in yellow gold, which complements the color of the diamonds. 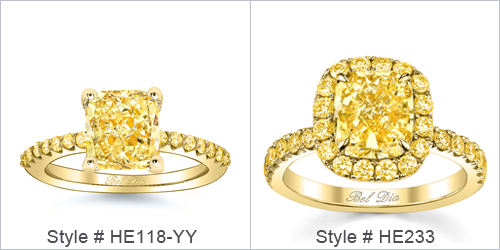 Style number HE118-YY features a u pave fancy yellow diamond band while style number HE233 features a fancy yellow halo and band. A split shank design will also add a unique design element to your fancy yellow diamond engagement ring. Style number HE143Y has a baby split shank. The slight split adds a beautiful element to this timeless design. Style number HJ514Y features a much larger split shank, which gives the wearer more finger coverage. If you’re interested in designing a custom yellow diamond engagement ring, please contact a deBebians jewelry expert at your convenience. We specialize in all types of custom jewelry and would love to assist you with creating a piece that you or your loved one will cherish for a lifetime.